Incredible lake sunsets and bubbling jacuzzis are framed by the window of New York State's only Wilderness Canoe Region. 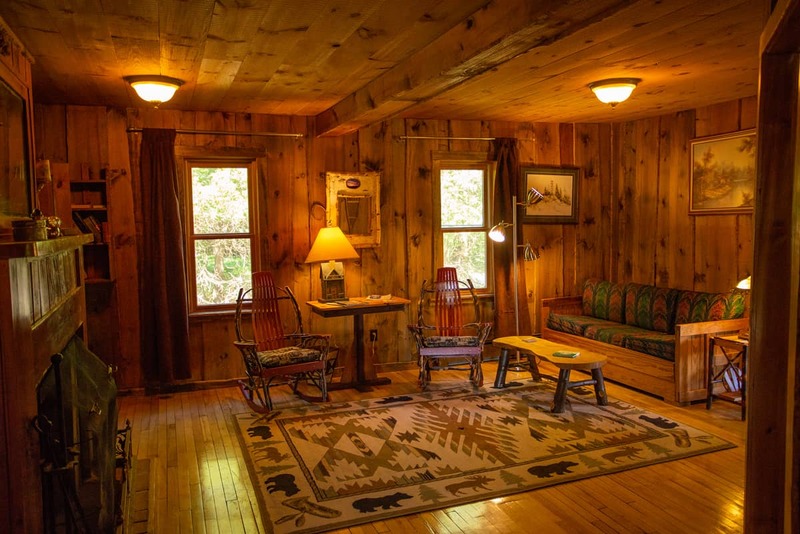 Rejuvenate in a lake view suite on 25-acres with private swimming beach, 1886 Main Lodge, nature trails, and seasonal amenities such as canoes, kayaks, cross-country skis, and snowshoes. Savor a takeout dinner in your suite from our Adirondack Alps Restaurant or goodies from our Old World Kitchen Store. Our Lakehouse is the closest building to the lake. Despite that, we sought to preserve the original character of the Great Camp lawn, which stretches out in front of it. Facing directly west, you will capture one of the world’s most incredible mountain-lake sunsets right from your suite, or with a quick walk down to our picturesque beach. Built from wood milled from the property, the Lakehouse was designed to match the Great Camp tradition of the Lodge, as you can tell from its iconic design. The Lakehouse has maximum flexibility for families or groups wanting their own individual lake view suite at night, yet with interior doors for gatherings during the day. Couples can also bask in its warmth as individual suites, or friends can rent adjoining suites. There is a total of 4 suites, and each can accommodate 2-4 guests for a total of 14. 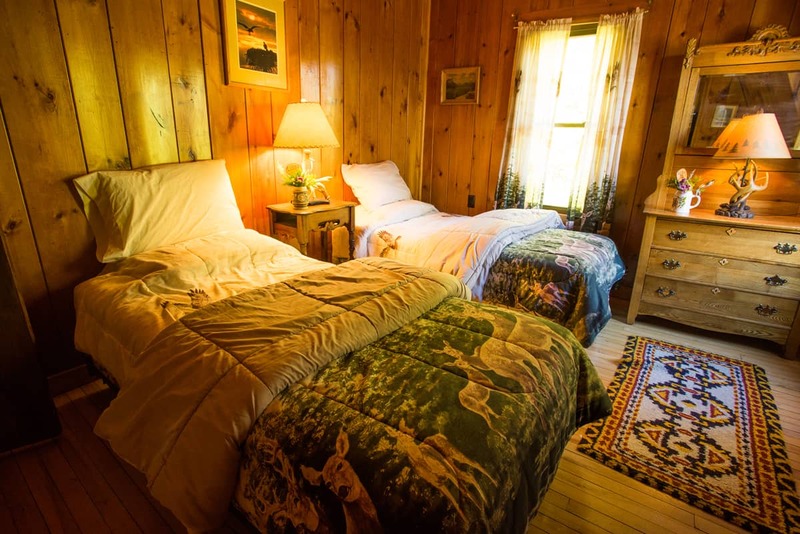 Sunset Pine is a cozy suite in our Lakehouse, nestled at the edge of the pines. With a private jacuzzi and queen bed, it is the perfect romantic getaway. 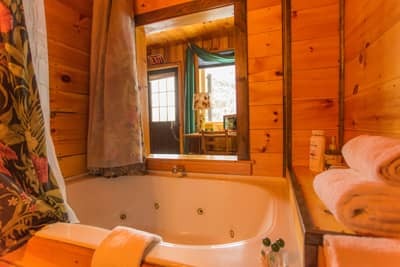 This suite is our closet suite to the lake with a beautiful sunset lake view, featuring a romantic Jacuzzi bath with view to the antique wood burning fireplace. The Eagle's Nest suite is an open second floor suite with sunset lake view. 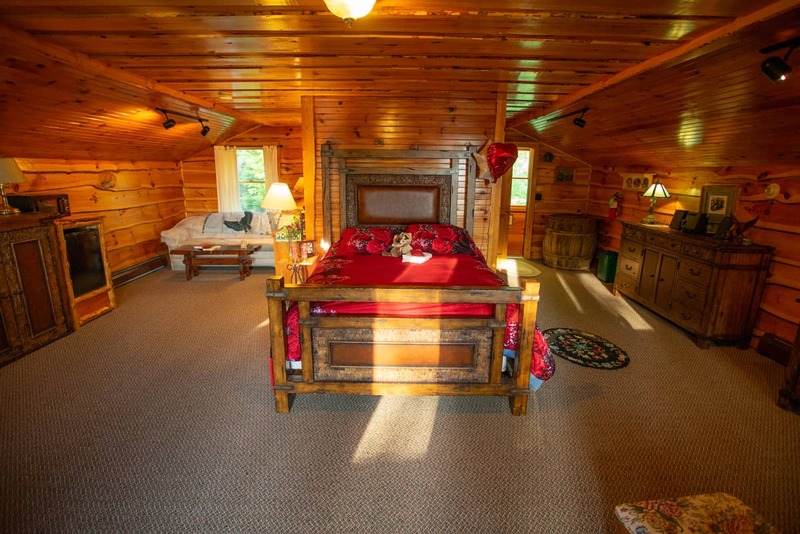 It features a queen bed and full fold out sofa with one bathroom. Home of Woodsmoke and Loons Watch suites, this “Gausthaus” is symbolic of the fusion of the Old World and the Adirondacks. This house was painfully restored - and we mean painfully. Had we known what we were getting into, well…. but Hohmeyer Senior insisted as it has such a distinctive character. So, we went right down to the rafters and restored what we could, and if we had to replace it then it came from wood milled from the property. 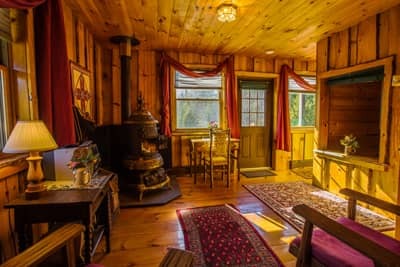 You can feel that original Adirondack hospitality with Old World charm nestled in all the “creature comforts” of bubbling Jacuzzis, fireplaces, kitchens and one beautiful lake view. 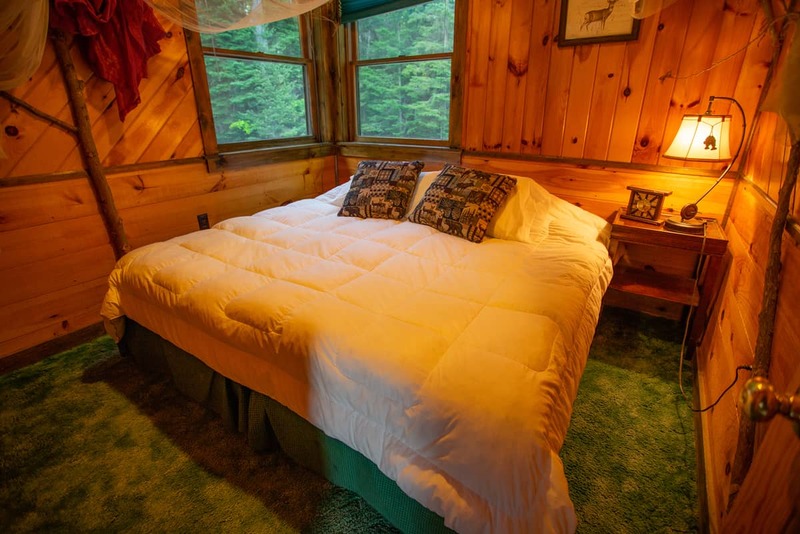 The Guesthouse sits on a small knoll overlooking our 3 acre Great Camp lake lawn and picturesque beach. On the other side, the original porch captures the morning sun, a favorite place for Hohmeyer Senior to read or to stay warm in the winter! 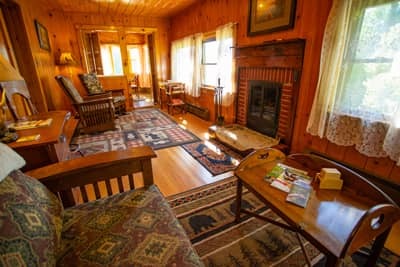 The Loons Watch suite is a two bedroom located on the second floor of our Guest House. 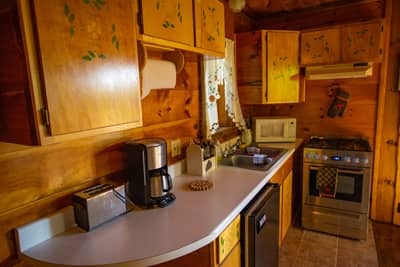 It features a sunset lake view, full kitchen and fireplace. The Woodsmoke suite is a two bedroom suite on the bottom floor of our Guesthouse. 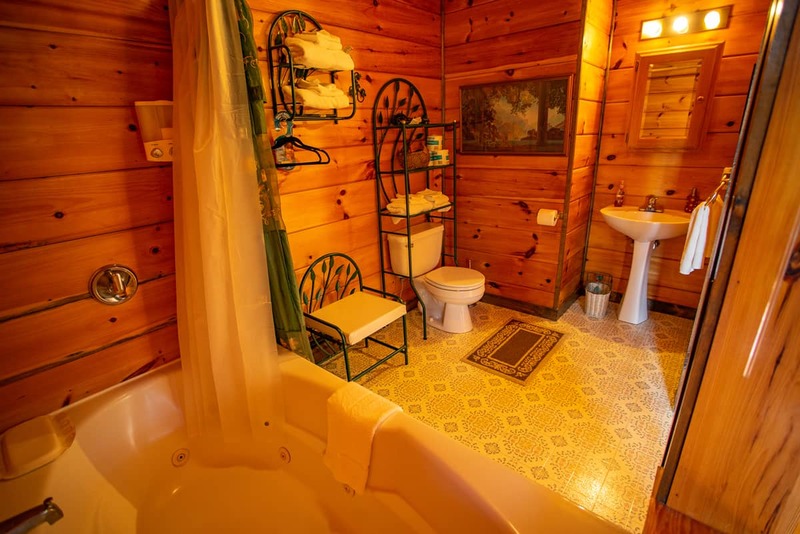 It has a double jacuzzi tub, as well as a separate shower. There's an experience package for everyone; whether it be culinary, outdoor recreation and nature, history, and wellness!